Jump Menu: Do wasp nests smell? Do you work in the evenings? Wasps in loft What kind of nest looks like mud on the wall? Are you able to kill wasps without direct access to the nest? Generally speaking, no. Wasp nests do not have a particular smell. However, occasionally if a large amount of insect food is carried into the nest, or in hot weather when workers are bringing a lot of water into the nest to cool it down, the nest can become saturated at the bottom of the nest. If it does not dry out quickly it can start to smell musty or mouldy. On occasion, nests touch plasterboard (ceilings or walls) and this moisture can seep through and stain. In really bad cases the plasterboard can slop off and expose the nest. Yes, not a problem, we can fit in jobs to suit you. If it is springtime and you are getting wasps in the loft, or they are getting in the house via the attic, it will be queens. 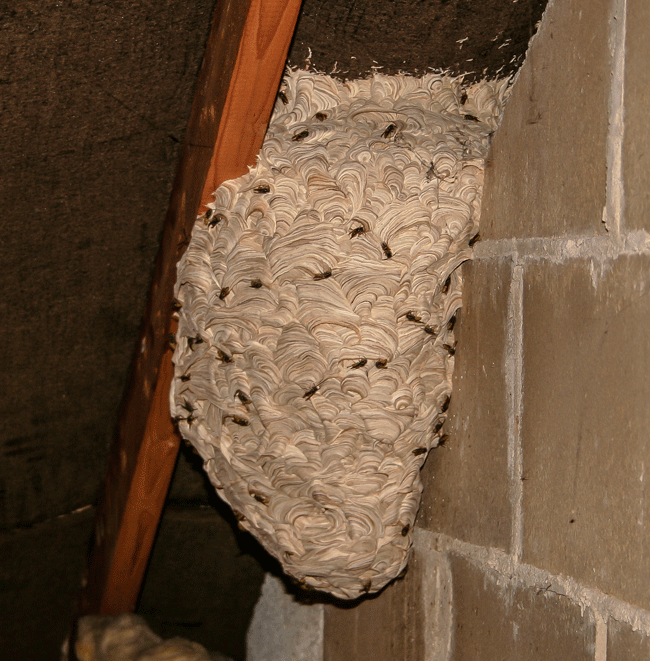 Loft spaces are ideal places for queen wasps to hibernate over winter. As soon as the weather starts to warm up, these queens will begin to emerge from hibernation. They need to feed right away, or they will starve. Sometimes queens make a mistake and find their way inside the house instead of going outside. They can be a nuisance, but this will not continue for very long. What kind of nest looks like mud on the wall? This is most likely to be a birds nest. Birds such as house martins build nests which look similar to wasp nests, but they are made from mud. Wasp nests are made from chewed wood, almost like paper mache. A wasp nest is normally light grey in colour with swirl marks across it. Are you able to kill wasps without direct access to the nest? Yes, we do not necessarily need to see the nest to kill it. We can take several different approaches when tackling a wasp nest. As long as you can see wasps entering, we can kill them, so you do not need to find the actual nest.